Hillcrest Country Club provided a sophisticated setting for the adult guests at this Mitzvah event to mingle during cocktail hour, and we loved how our photos showcased the skyscrapers serving as backdrops for this lovely venue. As actively engaged as we are with capturing individual moments throughout an event, it is often nice to hang back and be a fly on the wall, taking a candid photograph of the crowd interacting by the bar. This type of photography provides a sense of place. That pop of pink from the lighting inside lets us know a lively party will soon be underway, but with the warm golds and ambers of the outdoor setting it's easy to see why guests would tarry a little longer while sipping a beverage and enjoying an urban view at this beautiful Beverly Hills country club. 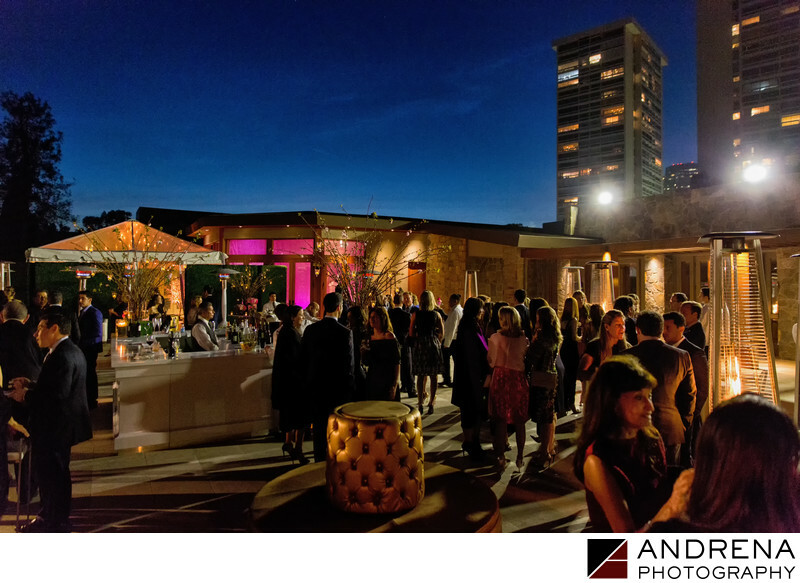 This space is a beautiful venue for events and parties of all kinds. Location: Hillcrest Country Club, 10000 W Pico Blvd, Los Angeles, CA 90064.